Ever wondered how dream homes are made? The question can be answered by our current apartments in Pune; we at Teerth Realties construct homes which can support your dreams. Our luxurious apartments can provide you with all the requirements that you need for living in style. 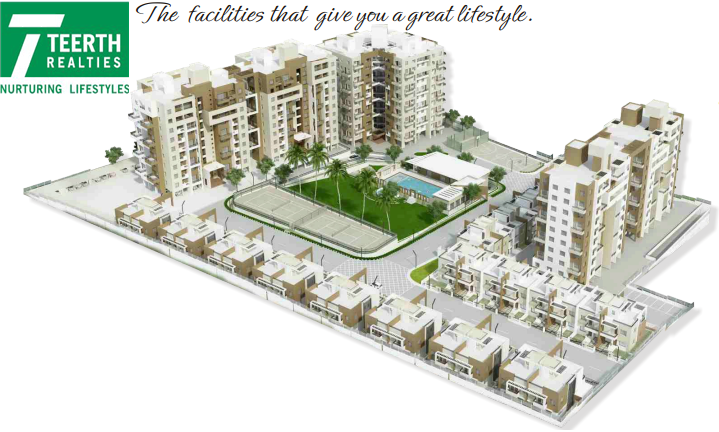 Our 2 and 3 BHK apartments have all the amenities and facilities which can prove beneficial in the long run. Baner is an upcoming area; there are several shopping malls and markets readily available for day to day requirements. The scenic highway is just a ballpark distance away; expect cool and breezy environments surrounding the apartments at all times. Teerth Realties is into construction business from years, we have developed several projects which have modern architecture in its base, and our projects are very different than other construction companies. This is where you would be in a position to differentiate the type of apartments we have constructed over the period of time.